Prelude features carefully curated, intimate lunches hosted by Dry Creek Valley Wineries and Growers. 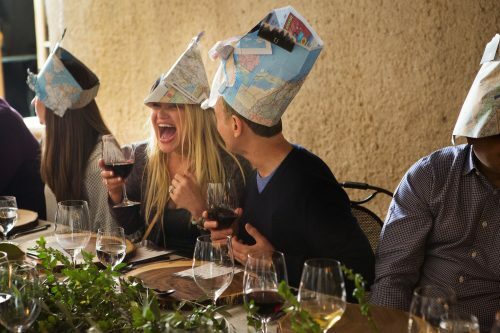 Kick off Passport to Dry Creek Valley weekend with a carefully curated winemaker lunch. This is your opportunity to enjoy delectable wine and food pairings while spending time with your favorite winemaker and learning about grape growing directly from the source. Cast Wines – Description to follow. Sip in the beauty of Dry Creek with a 4-course lunch on the hillside terrace at Cast, overlooking the northern end of Dry Creek Valley. We will greet you with a glass of bubbles and then have you delight in the craftmanship of chef Eric Johnson’s (Trading Post) trademark farm to table creations, paired with an assortment of white, red and rosé Cast Wines. Winemaker Mike Guylash will be on hand to share stories and a bit of wine from the barrel, while our owners will take you on a tour through the vineyard. Please let us know if we can accommodate any special dietary requests. 30 Seats. Lunch begins at 11:30 at 8500 Dry Creek Road Geyserville. Celebrating 30 Years of Dry Creek Valley Wine with a Founders’ Panel, Tasting & Lunch at Comstock Wines – A unique wine education opportunity featuring a panel of library Dry Creek Valley wines hosted by Dry Creek Valley’s founding icons including Shelly Rafanelli (Winemaker, A. Rafanelli Winery), Tim Bell (Winemaker, Dry Creek Vineyard), Chris Russi (Winemaker, Comstock Wines), Jeremy Kreck (Winemaker, Mill Creek Vineyards & Winery), Ed St John (Pedroncelli Winery) and Mark Vernon (CEO, Ridge Vineyards), moderated by San Francisco Chronicle’s Wine Critic, Esther Mobley. Taste through the complex structure as you sample the best of what the past 30-years has to offer. Then step into the now and enjoy a tour through Comstock Wines state-of the-art winery and idyllic rows of vineyards. Then you’ll be seated for a winemaker lunch hosted by Comstock Wines winemaker, Chris Russi highlighting the bounty of Sonoma County. An afternoon followed by good games, grand food and great wines awaits! 40 seats. Panel begins at 11:00am at 1290 Dry Creek Rd, Healdsburg. DaVero Farms & Winery – At DaVero Farms & Winery, we are deeply committed to Biodynamic farming and natural winemaking. Our farms are home to vineyards, fruit orchards, flower gardens, pigs, sheep, chickens, and olive groves. This years’ prelude to Passport lunch led by founding owner and chef Colleen McGlynn will be a true farm to table (and farm to glass) experience. We will be highlighting our estate grown wines, olive oils and produce. Our approach to winemaking is simple, let the vineyard and nature do the work. All of our wines are aged in neutral oak, fermented with native yeast, unfiltered, and a true expression of their vintage. We look forward to sharing the beauty and bounty DeVero Farms & Winery has to offer. 20 seats. Lunch begins at 12:30pm at 766 Westside Road, Healdsburg. Peterson Winery – Join us on top of the Bradford Mountain in the heart of Dry Creek Valley as we take in the sweeping views and enjoy a lunch beneath the oak trees. Peterson winery founder and winegrower Fred Peterson will be your tour guide through the vineyard as you your the 15 acres and 14 varietals that he grows at his home and property. Lunch will be served alfresco, and catered by local favorite, The Spinster Sisters. And of course, you will have the opportunity to try wines from the vines of this unique Bradford Mountain Estate Property. 22 seats. Lunch begins at 10:30am 4791 Dry Creek Rd., Bldg 7 Healdsburg. 40 seats. Lunch begins at 12:00pm at 2303 W. Dry Creek Rd. Healdsburg. Wilson Winery – Wilson will be hosting an exquisite three course Polynesian Fusion lunch catered by Chef Lisa Boisset of The Cook and The Drummer. Featuring Tahitian inspired seafood and pork, each course will be paired perfectly with Diane Wilson’s award winning wines. Enjoy a behind the scenes cellar tour with winemaker Diane Wilson in our picturesque setting overlooking Dry Creek Valley. 40 seats. Lunch begins at 11:00am at 1960 Dry Creek Road Healdsburg. $75 plus fees and taxes.